With Christmas just around the corner, it’s always a frantic rush to get family and friends an original and exciting present. 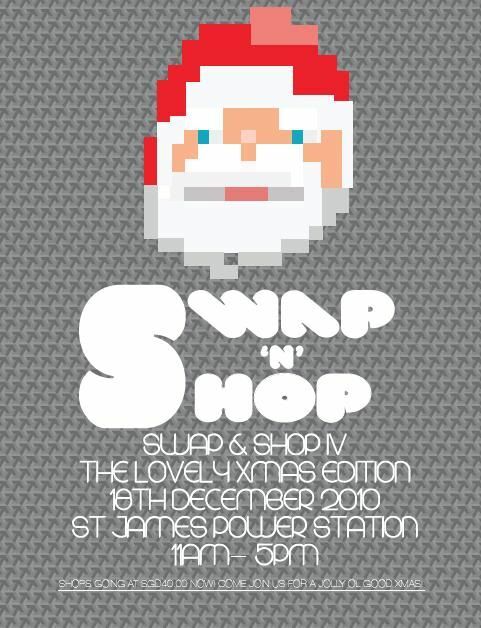 At this year’s Christmas Swap and Shop, you’re sure to find something for everyone! It's only S$55.00 per booth, so hurry register at www.swapandshopflea.blogspot.com. More information/ updates are available on the website! I will be setting up a booth there with my friends Addie and Sarah (: People like Qiuting, Kaykay and The Twins (Jiaqi & Hayley, in photos below) will be having booths too and we'll all be in the same area so do drop by! I'm sad to say that I have something on in the morning which I just found out has been further extended :/ Which is why I asked Sarah and Addie along so they can keep each other company. So if you actually um... care about seeing me in real life (I don't know how else to say this without sounding retarded/arrogant), I'm sorry but won't be there in the morning! Anyway, pictures from the Adonis lunch! 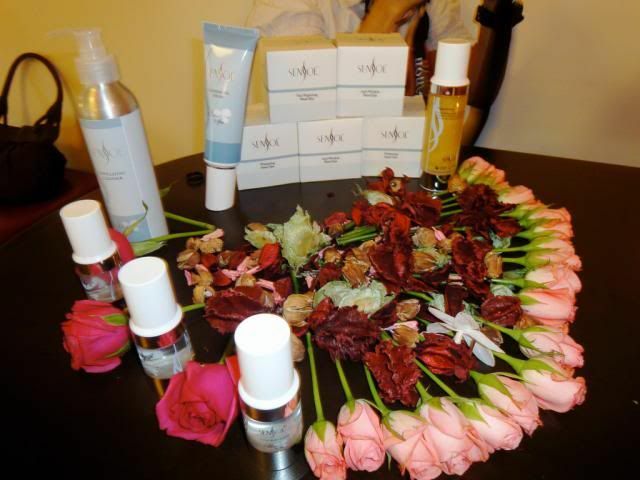 Qiuting is an Adonis ambassador, and they recently asked her to invite the girls in her dress-up session previously to a free facial by Adonis along with manicures etc, at their new Nex outlet in Serangoon. Sadly however, the new outlet could not be ready in time so they organised a super lunch for us instead! Qiuting decided that the theme should be White Christmas or something like that haha. I only remember that it meant I had to get myself a white dress. 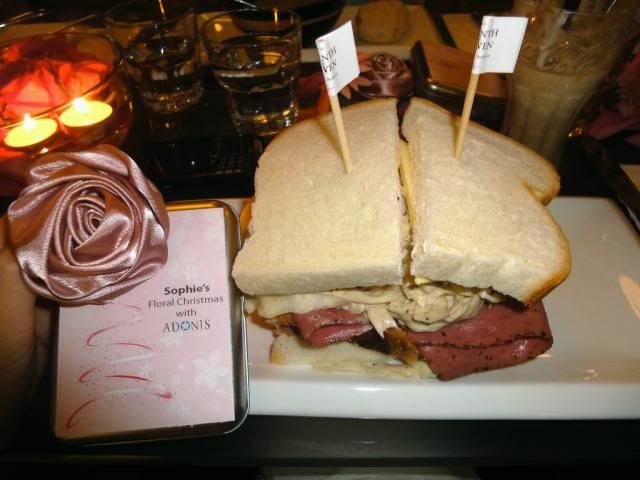 My massive sandwich, and the little metal box that Adonis gave to every girl, complete with our names! Geck Geck and Jiaqi (one of the twins). 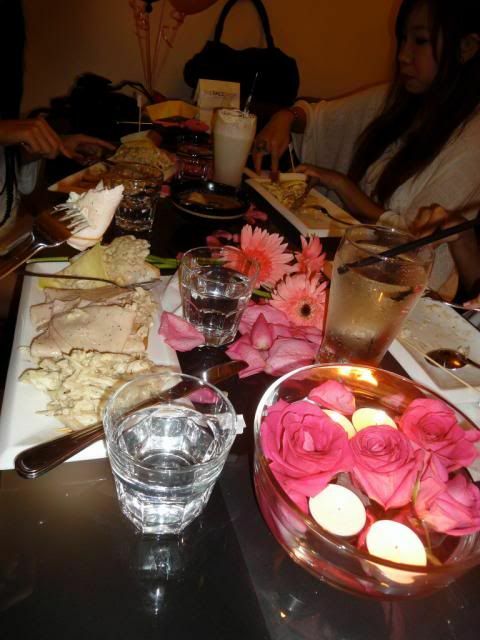 Oh oh the soups were really pretty awesome! I ordered 4 things: Coke Float, Mushroom Soup, Sandwich and Brownies + Ice-Cream. The Adonis staff really went the mile! 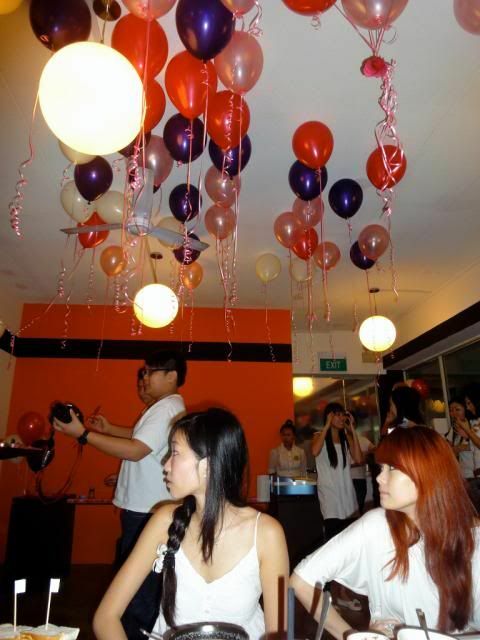 The area was decorated with flower petals and balloons! Pretty! 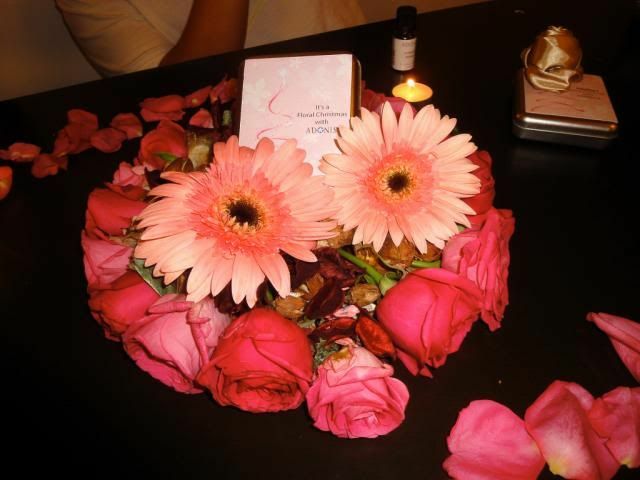 Inside the metal box, lying on a bed of rose petals was a small bottle of pure rose oil. The Adonis staff was explaining to us how aromatic oils should be pure for the full effect, and have to be used very sparingly and carefully! They brought in a sample of a non-pure oil and their own, and seriously the smells are SO different. 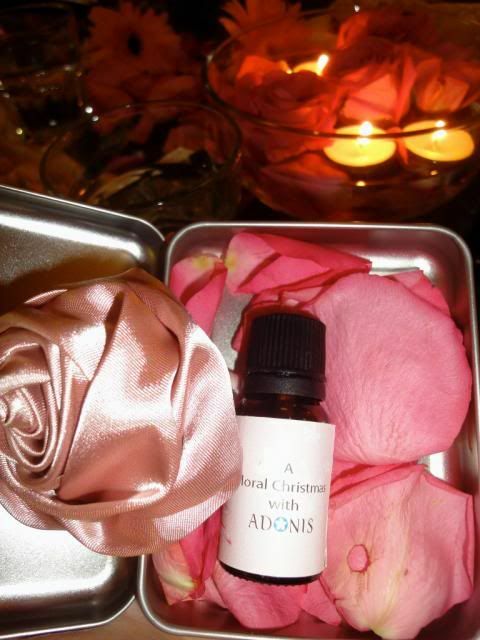 The Adonis one is light and fragrant, while the non-pure one was very heavy. The Adonis staff also gave each one of us the satin rose clip/brooch. More flowers to add to my hair accessories! Getting manicures! We were also given a hand spa each which consisted of massaging our hands/arms and putting it in this special bath. The skin is so smooth after! Haha took a photo with the Christmas tree in the lobby. And spot the little red-head retard behind me haha. Hahahaha the twins left their balloons fly along the taxi. 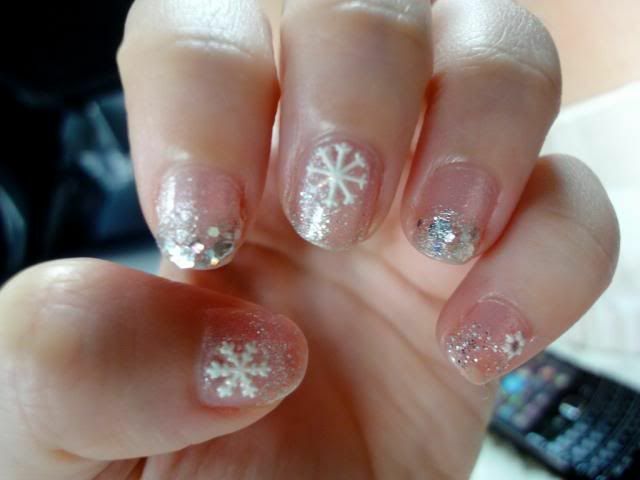 Here are my snowflake nails! I actually would have preferred a different colour base, but the staff had only brought in pinks. Apt for the season though! I'm really bad at maintaing my nails though ): I got these on Saturday, and cleaned them off on Monday! Anyway I've made good headway with my selling post :D I'm actually working on a new blogskin (just using Blogger templates lah, not web designer kind haha) in which my items for sale will have a page of its own! So far for clothes alone I have 43 items already. Might also be selling rings/bracelets/makeup! I spent the bulk of my time just now doing another blogpost which I've decided to post another time. Going to sleep, goodnight! 3 comments on "Adonis Lunch"
super love ur nails babe!! has alaric choo ever seen your face without makeup on?